You are here: Home » Florentines – from me to you! 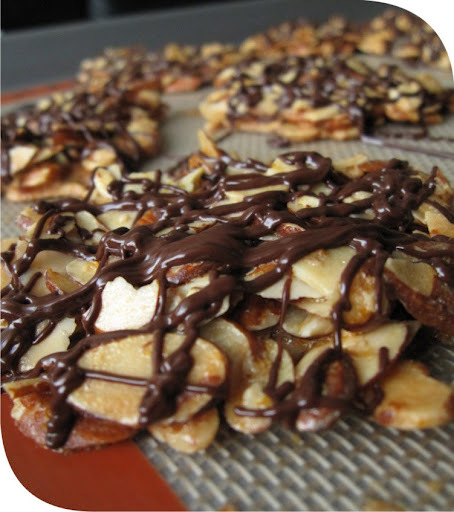 Florentines – from me to you! 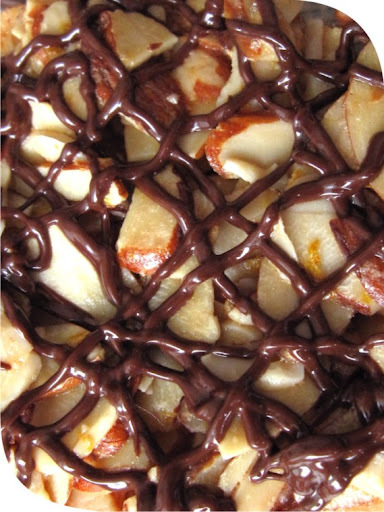 Florentines are like macaroons – they come in so many shapes and forms. I have seen (and eaten) them with macadamia nuts, whole hazelnuts, coconut, chopped almonds, dipped, sandwiched, and mixed with orange and ginger. But what is a florentine, really? 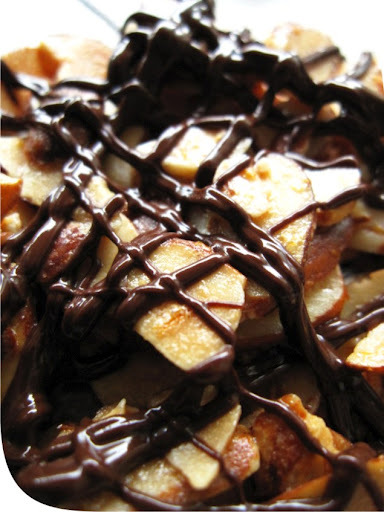 After some personal reflection a florentine = nuts + tuile batter = suspended in culinary science. There are so many recieps out there of different variations (chewy or crunchy? nutty or fruity?) it was hard to pick one to try. she used to order baked goods from some lady (yeah, I know, “some” lady! Nevermind that she has her own in-house baker to churn out goodies – she has to outsouce! Be still my Kitchen-Aid whisking heart.) and in the order were these almond cookies. I admit, they were good. All tuile, very little cookie. A nice crunchy, thin, waffle-y type of tuile too. Almonds (not so generously) sprinkled throughout. I have never been able to successfully replicate this recipe. I just can’t be stingy with the almonds. Oh well, another project for a rainy day. In a medium bowl, whip egg whites lightly and briefly until they are slightly frothy. Add the salt, sugar, zests, and almonds until combined. Drop tablespoon-sized mounds onto the cookie sheet and spread the batter out gently with a fork or your fingers. 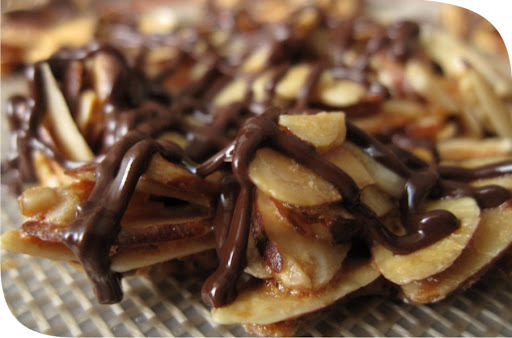 You want a nice, even, and crunchy cookie, so spread it out in a thin layer. Bake until golden brown. The original recipe said 10 minutes or so – but it took mine at least 20. Maybe it’s because they weren’t blanched? Anyway, keep your eye on them and take them out when they are golden on top. Let cool completely on the cookie sheet. Melt the chocolate drizzle or dip as you like.